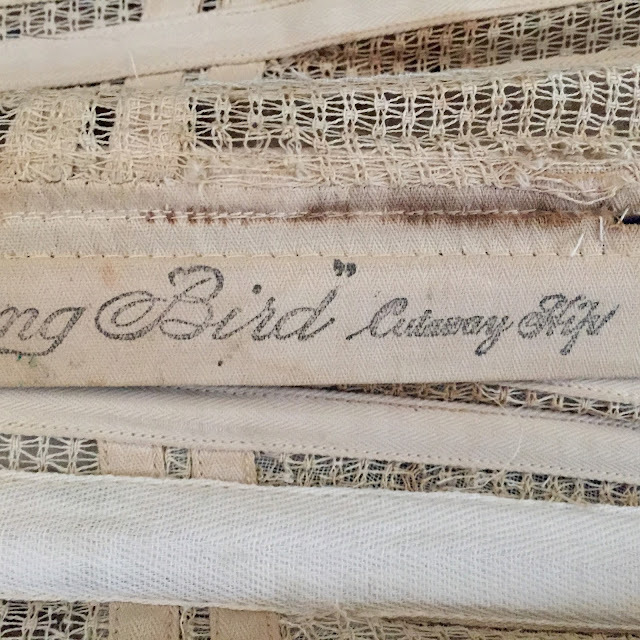 A Light-Weight Wedding Corset by the Hummingbird True Fit Co.
One of the many items on exhibit for “I Do, I Do: Seacoast Brides Say Yes” is a light-weight wedding/trousseau corset by 'Hummingbird True Fit Co.' It is of stiffened cotton with steel boning. 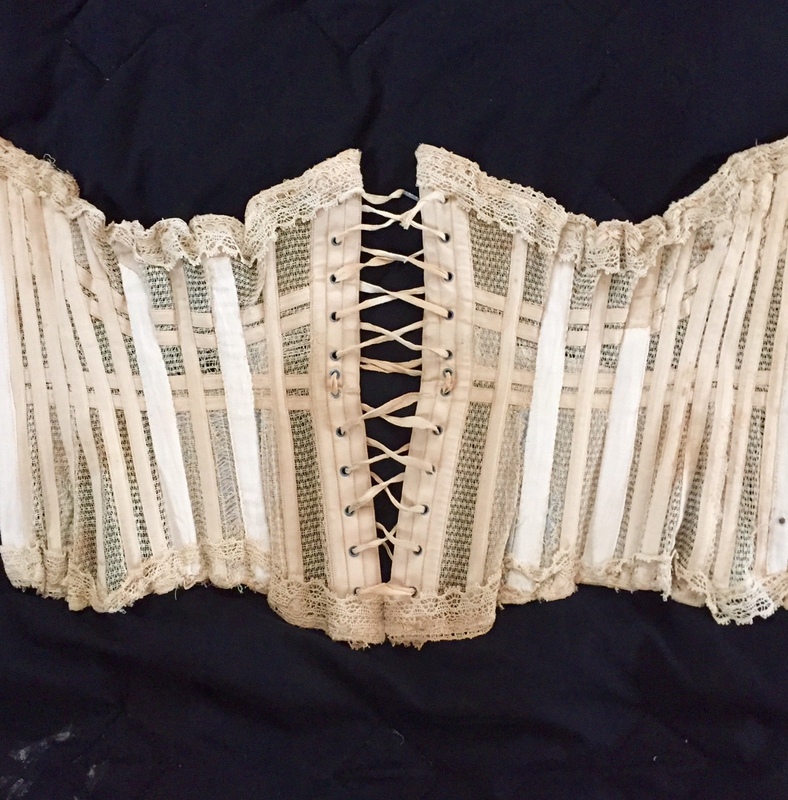 Worn in the late 19th or early 20th century, it was painstakingly repaired by a member of the Newmarket Historical Society board. 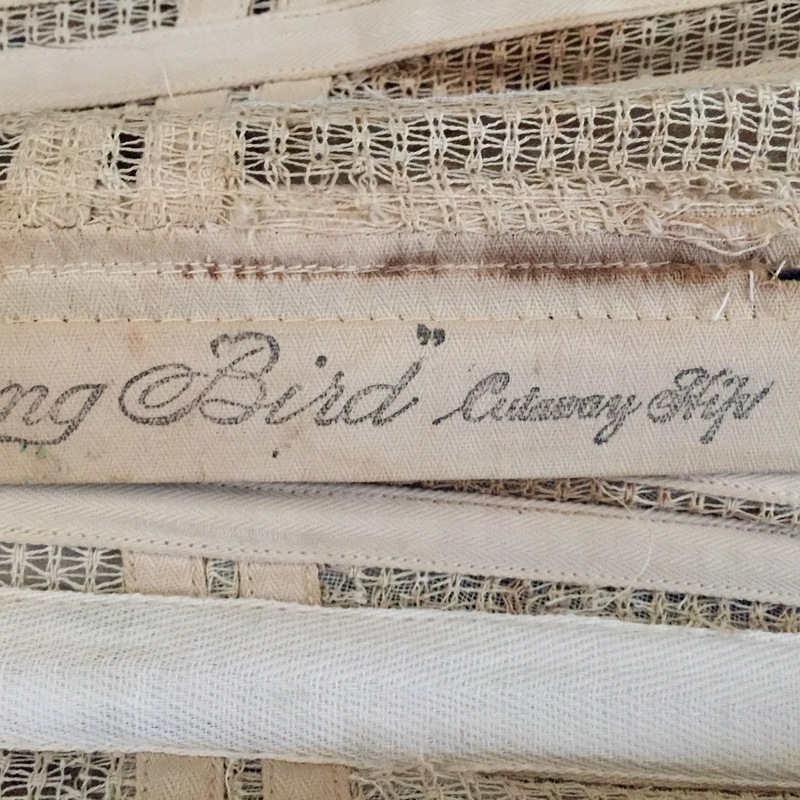 The wedding corset in the collection most likely belonged to Martha Julia Elliott. Martha was born July 26, 1899 in Yonkers, N.Y., and died in Newmarket on October 22, 1982. Her glamorous lace wedding dress and ivory wool going away suit survive as well. 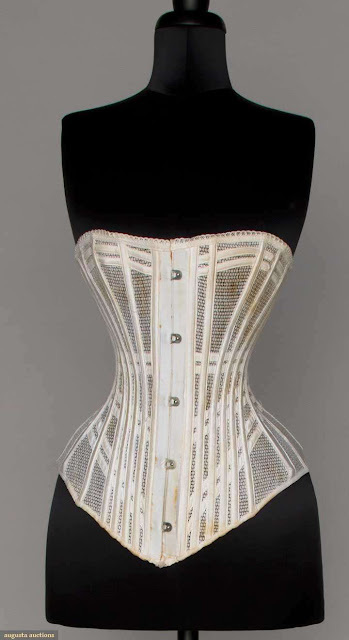 Another example of this type of light weight corset, manufactured by the same company, was sold at Augusta Auctions and extant examples are in museum collections such as the Metropolitan Museum. With today’s interest in waist training – often associated with work out sessions at the gym --you can still purchase a similar corset. 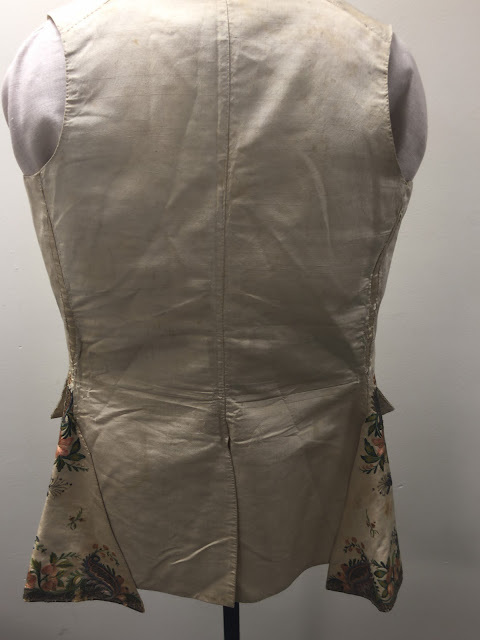 As part of my research fellowship at the Massachussetts Historical Society, I spent time examining two waistcoats in the collection – one owned by Andrew Oliver and the other by William Tailer. Lt. Gov. 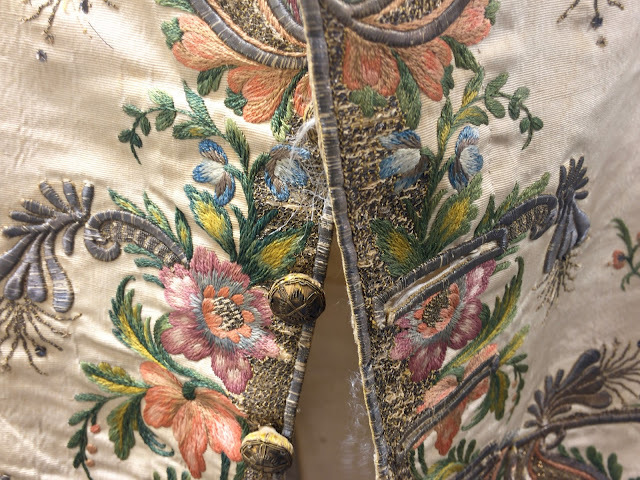 William Tailer's stunning embroidered waistcoat with metallic thread and spangles, c. 1720-1730, is housed in the collection of the Massachusetts Historical Society. Born into the wealthy Stoughton family, he served as Lt. Gov. of the Province of Massachusetts Bay. Tailer died in 1731/32. 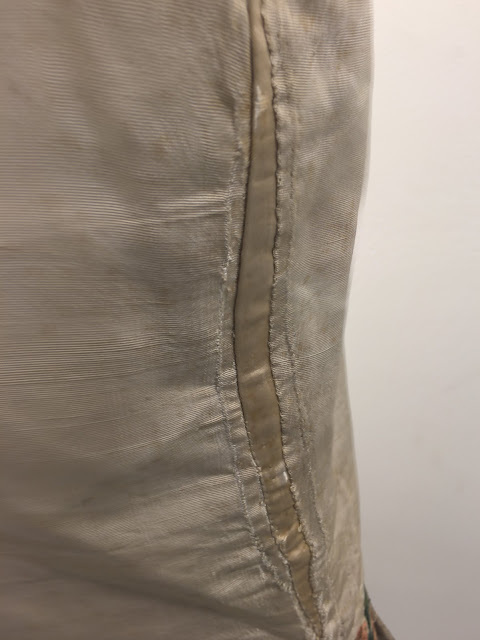 He was the father of Rebecca Tailer (Byles) whose 1747 wedding dress is also preserved at the MHS, along with family papers, letters and copy books, adding to the rich documentation available for this merchant elite Boston-based family. The embroidery is on a heavy white/off white silk and is complex, with naturalistic rococo floral motifs, including some lovely shading of the leaves and flowers. 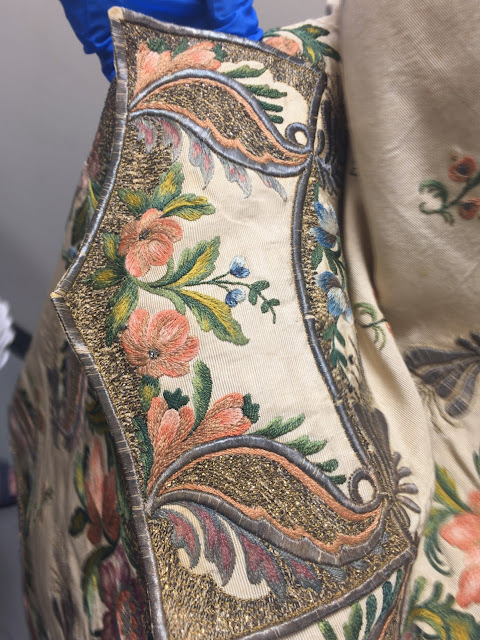 Most likely from England or from France, inspection reveals the garment was altered - let-out- in the sides and along the neck/shoulders to accommodate Tailer’s increasing girth. 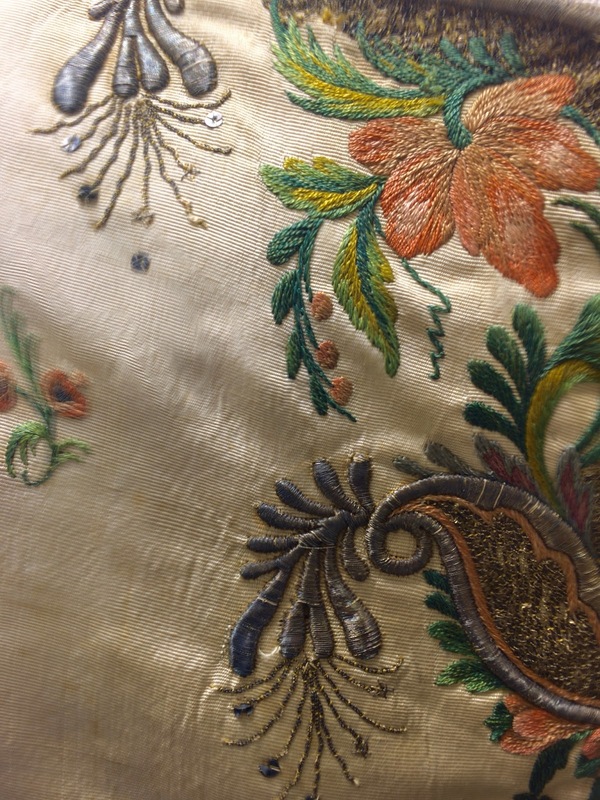 The alterations were skillfully done and would not have been visible under his coat. 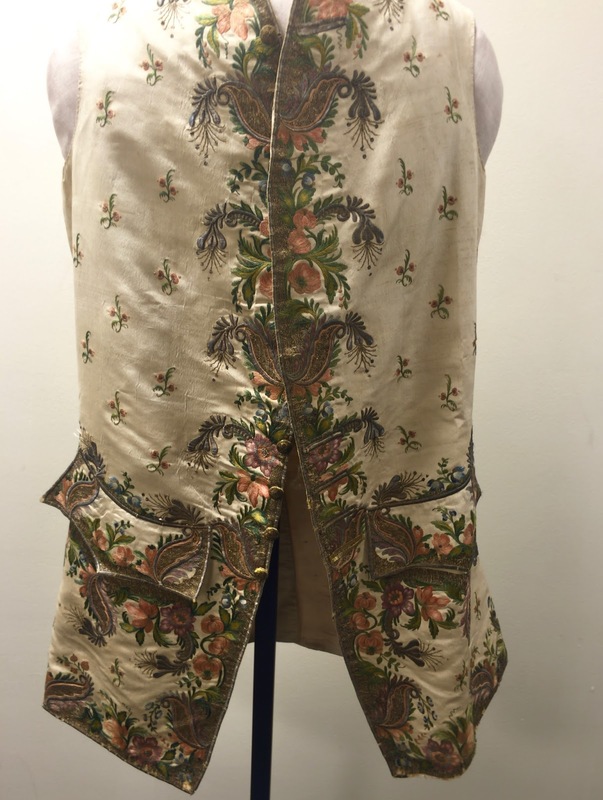 The waistcoat features actual pockets (rather than ornamental pocket flaps). The buttons are backed by gold foil and feature metallic thread over a wood core. 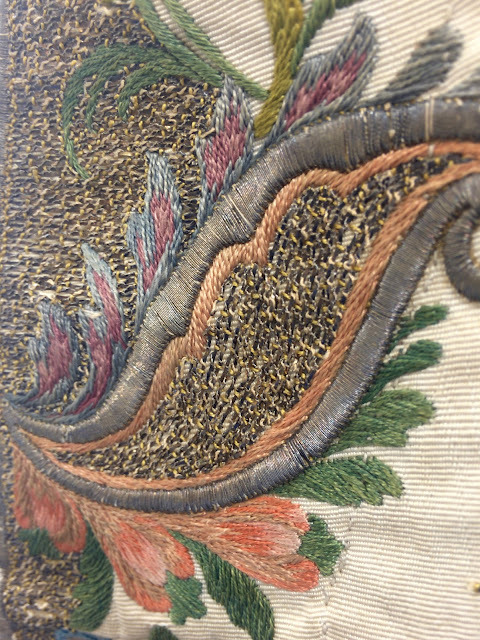 The buttonholes are meticulously finished, also with gold thread. 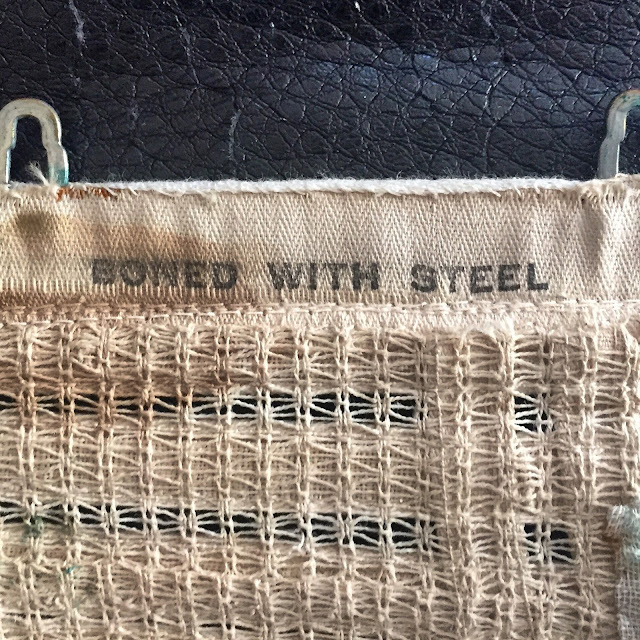 The waistcoat is in fine condition and I will share more as my research progresses. 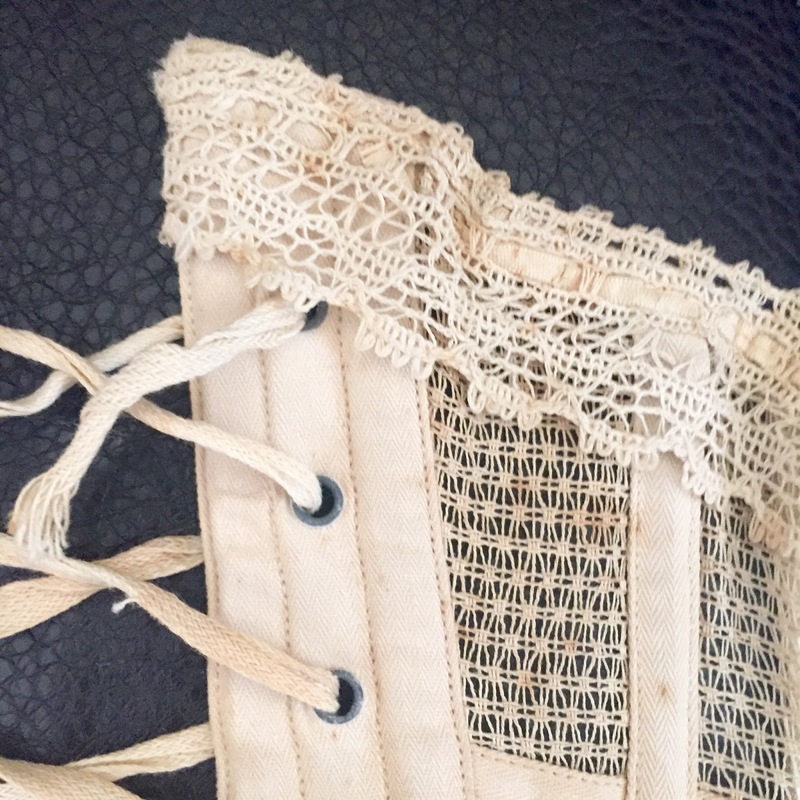 Thank you to Curator Anne Bentley for her assistance and for sharing her knowledge. 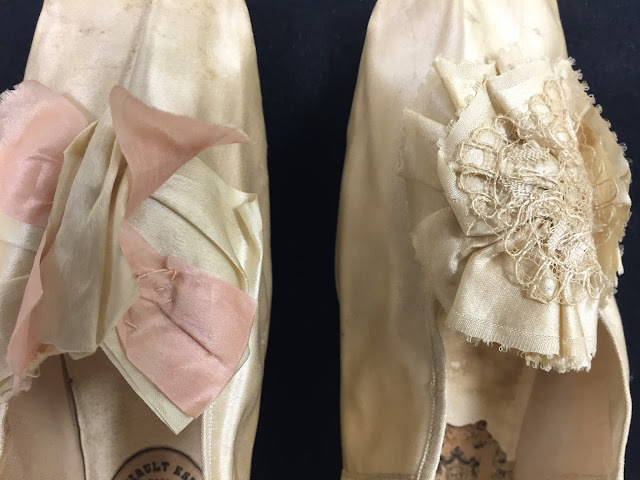 Such pretties -- a wedding shoe and a dancing slipper of silk, satin, ribbons, lace, and leather, c. 1860. 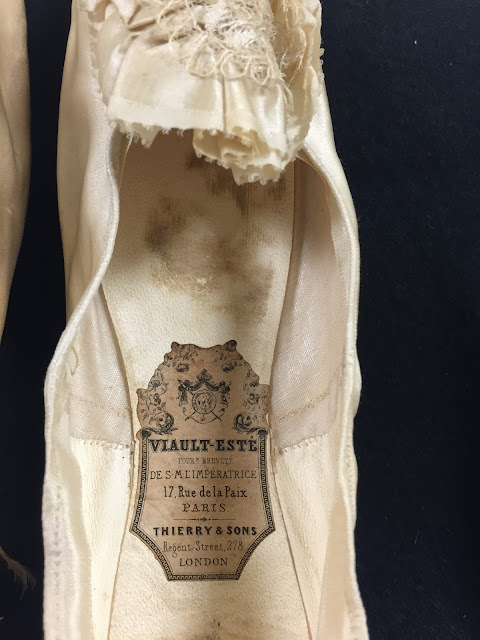 They were manufactured by Viault-Este, a prolific mid-19th century French shoe concern. Note the wear marks on the footbed. They joined with London-based Thierry, and greatly expanded their exports, during the 1850s. Their labeled, special occasion ladies shoes are found in dozens of American collections. With an elegant, stylish appeal, they were a go-to shoe for middle to upper middle class Victorian women. A knock on heel kept costs down and the ability to personalize them made them attractive to customers. 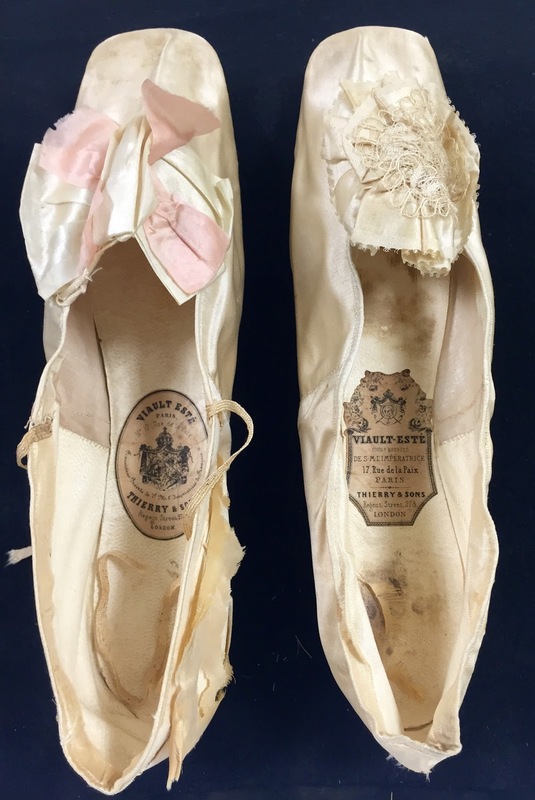 These two shoes (one each of a pair) were worn in New England by Sarah Dutton (Leverett) Tuttle (b. 1835.) The wedding shoes feature a delicate ribbon and lace rosette, while the dancing shoe is accented with a cheerful pink silk bow.